25 per package. 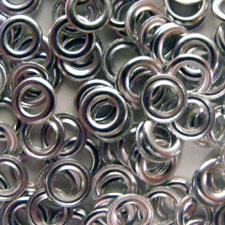 It's our 1/8" Silver Eyelet Washer for backing eyelets. Perfect for reinforcing 1/8" eyelets and making a clean finish for the back of your garments. Reinforces fabric to reduce the chance of the eyelet loosening or falling out.